The 82nd Annual Singing Christmas Tree took place at Belhaven University earlier this month. The event first debuted to the public in 1933 and has become a yearly tradition. 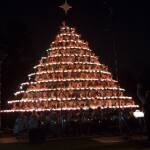 Belhaven’s Singing Christmas Tree was named one of the top 20 events in the Southeast by the Southeast Tourism Society, and has been featured in Southern Living Magazine. We would like to share a video from this year’s event, featuring five timeless Christmas classics: O Christmas Tree, Jingle Bells, Joy to the World, Hark, the Herald Angels Sing and We Wish You a Merry Christmas. In 1933, a group of faculty and students, led by music professor Mignonne Caldwell, had the idea to construct a wooden frame for the campus choir to stand on while performing traditional Christmas carols. Some 82 years later, that moment shines bright as America’s Oldest Singing Christmas Tree, a Belhaven University tradition. This year’s performance, open to the public, takes place on December 5 and 6 at 7:30 p.m in the Athletic Bowl at the center of campus. This wonderful community event has been highlighted by the likes of Southern Living Magazine, and named among the top 20 events in the Southeast by the Southeast Tourism Society. Ms. Bettye Quinn, Associate Professor of Education and Director of Elementary Education, has seen the event 77 of the 81 times it has taken place. Since then, the Singing Christmas Tree has taken on a few technological advances. A state of the art sound system is used and the candles remembered by Ms. Quinn have been replaced by LED lights. The 35-foot tall tree holds up to 100 men and women singers, and the LED lights change colors in various patterns and sequences according to the character of each Christmas carol.